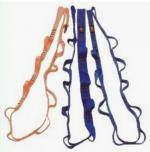 Often used as an adjustable loop for personal horizontal tie-offs to pipes, trusses, ladders, etc. to secure you at a particular distance from your work while working high. Rated at 3500 lbs. This is an aid in positioning only. Not to be used for fall protection. For fall arrest, use a shock absorbing manyard. Color provided is black with a white tracer. All Black. Rated at 25,000 lbs. Choose length in cart on next screen. Expendables Tape Batteries Blackwrap Cordage Misc. Hand Tools Wrenches Multi-Tools Knives Knife Sharpeners Screwdrivers & Accessories Electrician's Tools Strippers / Cutters Soldering Irons Misc.